Quality: Select bright, fully ripened cherries of dark colored varieties. 1. Wash, stem and pit. 2. To 1 quart (1-1/3 pounds) cherries add 3/4 cup sugar. 3. Mix until sugar is dissolved. Pack into containers, leave headspace, seal and freeze. Syrup pack: Pack cherries into containers and cover with a 40 percent syrup. For a better quality product, add 1/2, teaspoon crystalline ascorbic acid to each quart of syrup. 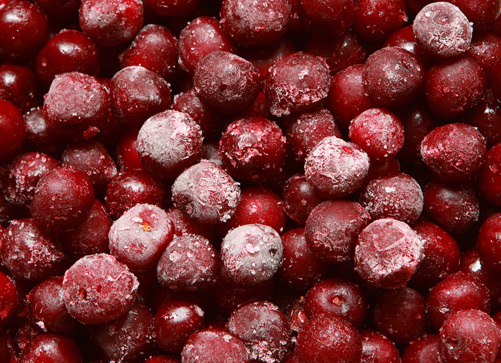 Pack fruit and cover with syrup, leave headspace, seal and freeze.